so for you that dont protect your face as much as you prefer glasses for the comfort, do you use a mouth guard? ?, if so, any particular ones? My lips offer enough protection to my teeth. wondered that, just a cheap one from sports direct, sounds too easy, wasn't sure is anything to look out for? or avoid? Gum shields is gum shields. I know some very expensive ones they mould it directly in the store mind you. Regarding the lower mesh mask, I bought some single-sided foam (like the anti-draft stuff you get for doors but much thinner) and put it at the top where the bridge is. That helped a lot. I'm not sure why companies don't just do that and make a rubberised one where it rests on your nose and also further to the sides. I know there are those ones on Firesupport that have fabric on, but they look like they'd get in the way of your nose more than they'd help with comfort. As for gum shields, I've owned a lot of different ones over time and frankly the fitted ones are far more comfortable (granted you forget you really have on in after 5 minutes) but primarily they're good as they don't like to fall out half as easily as the 'boil and bite' ones. I never wear one during games though because I generally can't stand them, and also it doesn't stop that BB hitting your lips or flying into your mouth. I've seen people using them though so it must be viable. Always worth spending bit of time to modify a mesh lower rather than not bother. Talking as a rugby player here, DO NOT BUY THE CHEAPO SPORTS DIRECT ONES, they're made from such a cheap material your "moulding" barely makes a difference and it will fall out the second you open your gob. Don't have much experience with more expensive boil and bite mouthguards but if you're desperate for a mouthguard (not sure why you would be ) get a fitted one from an orthodontist/dentist so you can actually speak, should be really comfy so you forget about it after 5 mins and it doesn't fall out ! I bought a lower mesh mask after somebody decided to full auto into my face from what seemed like a relatively close range. Aside from the teeth, it can leave marks on the skin and lips which could take awhile to heal up. As said above, they probably need altering/bending to fit your face better. They also vary in shape a bit as well so if you have a big nose, look out for ones with more nose room etc. The trouble with masks is that it's a bit harder to aim if you're trying to rest your cheek on the stock. Good face protection and high mounted scope. 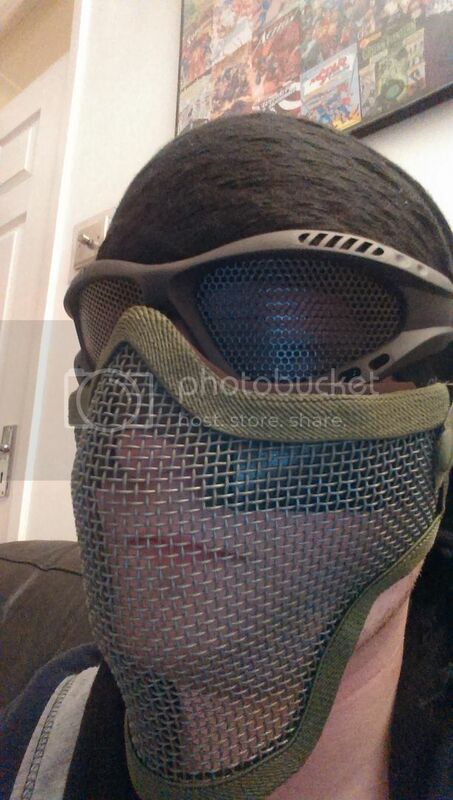 used to wear lower face mesh, works well and probably wont steam up. As for gum shields. I've seen people having their lower teeth shot out, as most only wear upper ones, this would not protect them. Also they are meant to take a blow from a fist to the face, not a 6mm at ~1j. Also my close friend always plays with mask, except ONCE when his girlfriend joined in and he lent it to her and played only with goggles. After a long process, lots of pain and money, he now has a fake tooth. He also have quit airsoft as he feels really uncomfortable with it even when masked. I can't vouch for how good it is, and it necessitates wearing a balaclava (which sounds awfully warm) or having elastic straps all over your face in addition to the not particularly comfy mesh, at which point you'd be better off with the lower half face mask. For woodland/outdoor stuff where I'm less likely to be shot at point blank I wear a sisu 2.4 mouthguard (very very low profile, but hard as nails - I've been hit in the teeth with it on and they're all still there! ), it's pretty good in that you can talk/drink/breathe properly with it in, still can't whistle though! For CQB/indoor stuff it's lower mesh/full face every time, I took a chance a few months ago with gumshield for CQB and ended up covered in my own blood when about 5 guys opened up on my face from 10-15' away (I was a dead man walking too!). Won't be doing that again. a guy wore one at UA last time, said it was great, never had a problem, im just cautious! think someone (on this forum?) made a face protection attached to the coms mic. wasn't too disturbing in looks, not sure I'd trust it thou as it leave angles free... maybe in combination with upper & lower gumsheilds. I use a lower face mask and have a bit of a hooter so the metal mesh really rests on my nose and can be uncomfortable so modified it with foam like one of the posts above. Also modified the foam to create a slight raised piece to fill that gap between the goggles and mask that i've seen a few people take hits between and left with those great big welps on their face. Have kept it as low profile as possible but offer full protection without wearing a clunky full face mask.